A classic ceviche recipe. 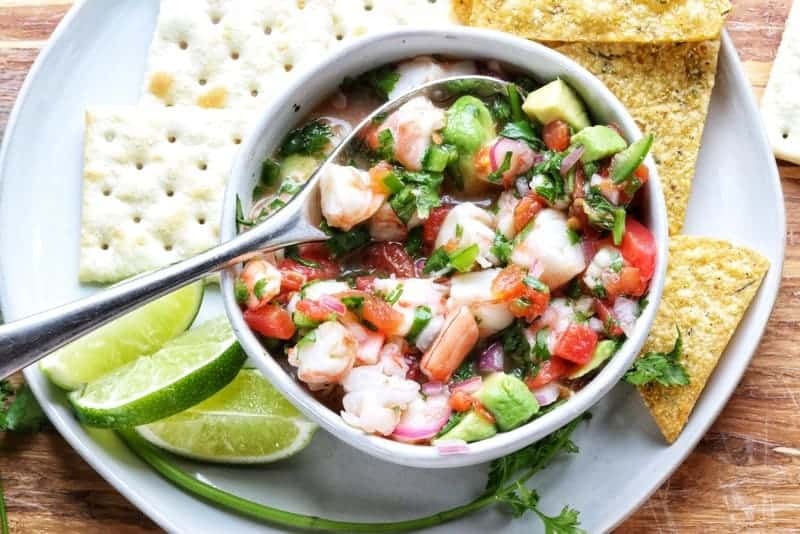 Learn how to make ceviche using shrimp that are cooked with lime and lemon juice & is ready start to finish in just 45 minutes. Thank you to Tomato Wellness for sponsoring this post! As always, all opinions are my own. Serve this delicious and simple ceviche on tostadas, with chips, or by the spoonful. I adore the fresh flavors of ceviche, but I’ve never made a ceviche recipe at home, until now. Let me show you what I learned during my research, tips, and tricks I came by, and how simple this delicious, light appetizer (entree?!) is to make in the comfort of your own home. Ceviche is a seafood dish popular in the Pacific coastal regions of Latin America. It’s typically made from fresh raw fish cured in citrus juices, such as lemon or lime. The dish is not cooked with heat but rather cured with acids in the citrus juice. Very fresh (or frozen) seafood must be used. What Fish To Use For Ceviche? Is It Safe To Eat Ceviche? Food science that comes into play in the making of ceviche. The acidic lime juice quickly transforms the fish, rearranging its proteins, making it safe to eat. The key is to use only very fresh fish. Stop by your local fishmonger and ask for the freshest fish they have, then use whatever semi-firm white fish they have that’s the freshest. TIP: When bringing the fish home, you must keep it on ice in the refrigerator if you won’t be using it immediately. Make sure to buy the fish the day you plan to make ceviche or use frozen. Use frozen fish that is thawed if fresh fish is not available. Cooking requires heat, so ceviche isn’t cooked. But it’s not exactly raw, either. Both heat and citric acid are agents of a chemical process called denaturation. Heat or citric acid changes the proteins in the fish, altering their chemical and physical properties. When fish is placed in citrus juices, this process of denaturation turns the flesh firm and opaque. After soaking in citrus juices for just a few minutes, fish develops a firm, opaque exterior but maintains a raw, sashimi like interior. If you marinate the fish too long, it gets tough or overdone. TIP: A flakier fillet, like flounder, snapper, or sole, or tender shellfish like scallops may only need to marinate for about 15 minutes. A hearty and dense fish, like Mahi-Mahi, could take closer to 50 minutes or an hour to be ready to eat. It’s important to note that citric acid won’t kill bacteria the way that heat does. It’s very important to use fresh, disease-free, fish. To be super safe, you can parboil the shrimp prior to curing the fish in citrus juice. Cooks Tip: Use thawed frozen fish if you’re not confident in the freshness of fish available. If you have access to fresh fish, you can skip the parboil step and simply marinate the fish in the lemon and lime juice. Parboil Shrimp in a pot of boiling water for 1 minute. Parboiling is just a fancy word for partly cooking food. NOTE: Before adding shrimp to the boiling water, have an ice bath ready. An ice bath is simply a large bowl of ice and water. Note: An ice bath is used to STOP the cooking process right away, so work quickly but carefully. Remeber you are parboiling (partially cooking) the shrimp. We want the acid from the citrus juice to do the rest. Remove the tails from shrimp by holding the center of the shrimp and gently tugging on the tail portion. NOTE: By gently pulling and twisting the tail just slightly, you should get the meat inside the tail to release, resulting in less waste. Chop the shrimp into even bite-sized pieces. TIP: You eat with your eyes so take care when chopping both the shrimp and vegetables -they are the stars of this dish and you want them to look pretty! NOTE: In my extensive research on how long to marinate fish for ceviche the answers varied widely. I listened to the trusted resource, J. Kenji Lopez-Alt of The Food Lab. 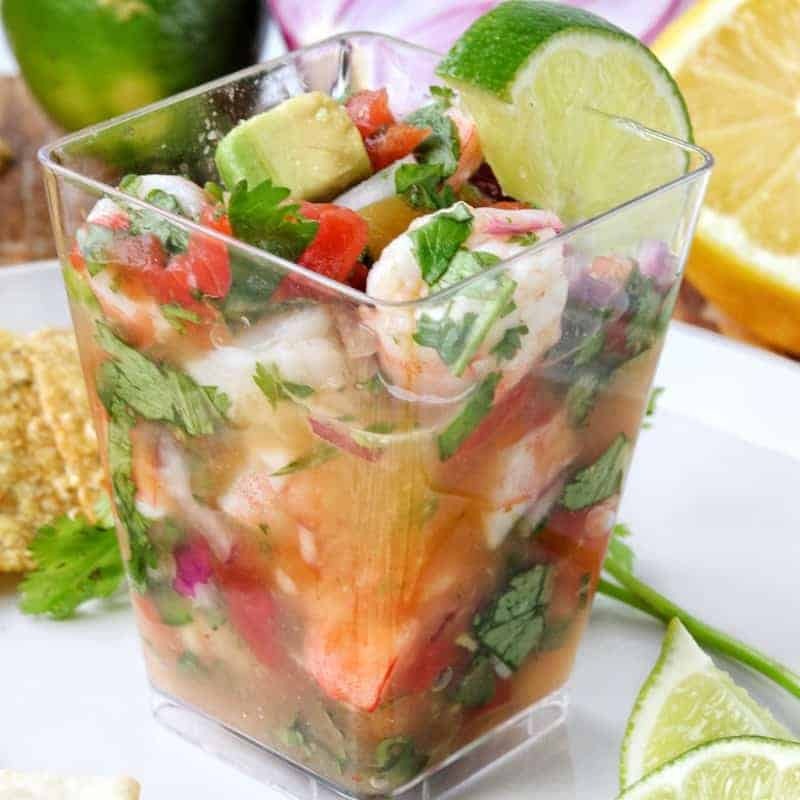 Check out his advice yourself in this extensive article on ceviche for more information. Add the shrimp to the vegetable mixture and stir, adjusting the seasonings if needed. There are many ways to eat ceviche, each one just as good as the other. But my personal favorite–> eating it by the spoonful! 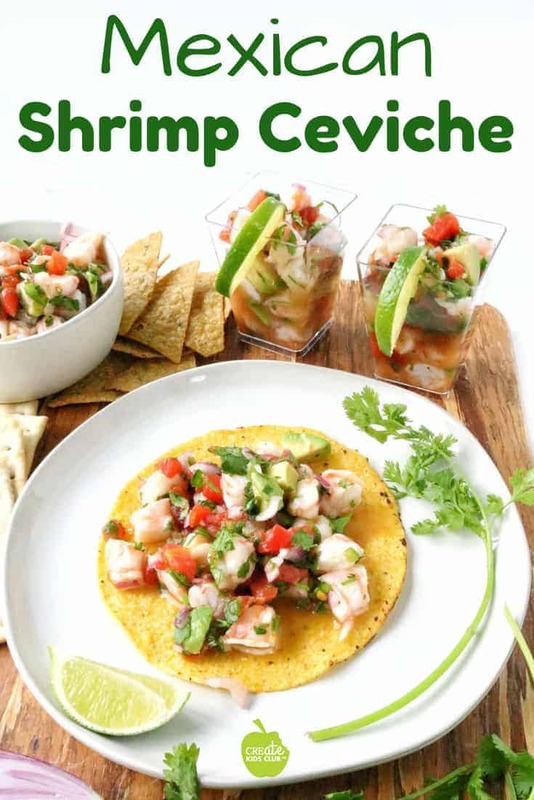 A homemade shrimp ceviche recipe that is easy to make right at home. Watch the how-to video and see how to make this deliciously simple recipe in no time at all. optional: tostadas, crackers, or tortilla chips for serving. Boil water in large pan. Turn heat off. Add shrimp to boiling water. Cook for 1 minute. Drain shrimp and immediately add to ice bath. Remove tails by tugging gently on the tail, then chop shrimp into bite sized peices. Place shrimp into a flat bottom pan (so the marinade can better coat all pieces). Add 1/2 cup of the lime juice and the lemon juice. Meanwhile, in a medium bowl, add canned tomatoes, onion, jalapeno, avocado, cilantro, salt, sugar. When the 30 minutes is up, drain the shrimp. To the medium bowl with vegetables, add the rest of the lime juice, the orange juice, and the shrimp. Serve on tostadas, in individual cups, or salsa style as a dip for crackers or tortilla chips. Alternative Fish Options: Any semi-firm white-fleshed fish like sea bass, striped bass, grouper, or flounder. Scallops work great too. Adjust seasonings as needed to suit your tastes. When bringing fish home, you must keep it on ice in the refrigerator if you won’t be using it immediately. Make sure to buy the fish the day you plan to make ceviche. Use thawed frozen fish if you’re not confident in the freshness of fish available. A flakier fillet, like flounder, snapper, or sole, or tender shellfish like scallops may only need to marinate for about 15 minutes. A hearty and dense fish, like Mahi-Mahi, could take closer to 50 minutes or an hour to be ready to eat. Parboiling means to partially cook. An ice bath is a combination of ice and water used to stop the cooking process. To easily dice an avocado, slice it while in the shell, then use a spoon to scoop out the pieces. Click for more Recipe Videos. Love this informative post! I have never made ceviche before but now I want to give it a try!